Play more online rummy on this festival of Maha Shivratri with Junglee Rummy. 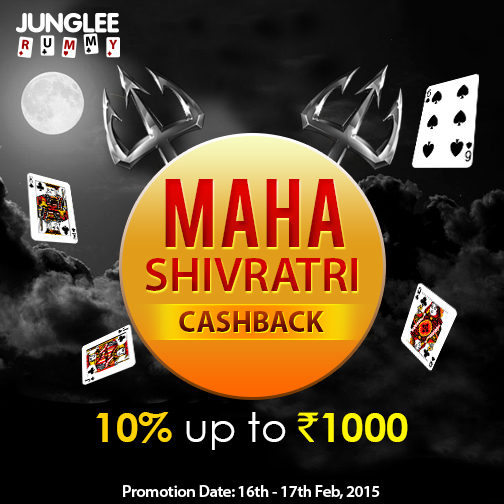 Junglee Rummy has brought a rummy cashback promotion named Maha Shivratri Cashback from where you can avail 10% returns up to Rs.1000 when you play cash rummy games and lose. Maha Shivratri Cashback from Junglee Rummy will begin on 16th Feb 2015 at 00:01 hours and will end on 17th Feb 2015 at 23:59 hours. You have to make a deposit of Rs.1000 to join the rummy cashback promotion. Play as many cash rummy games in the promo period and claim your 10% returns when you lose. The maximum amount you can claim is Rs.1000. Avoid making withdrawal requests while the promotion is live as it will disqualify you from the rummy cashback promotion. Also, update your valid e-mail id and contact number before joining the promotion. To know more about Junglee Rummy and the gameplay in the website, read our Online Rummy Reviews on Junglee Rummy.If you are regular player with them, let us know how you feel playing online rummy at Junglee Rummy. You can drop your comments in the comment section below.